Not so long ago, back in the late 1990s, I was a junior in high school, and I was entering college as a full-time freshman. I couldn't even drive a car legally, yet I was expected to know what I wanted to do for the rest of my life. I had always loved science, so I was going to be a scientist. Yes, your favorite blogger was almost a genetic engineer. I took the necessary classes to fulfill my requirements, but since I was attending a local branch of a larger university, class choices were limited. I filled my schedule with biology, chemistry, English, calculus, and psychology. When I graduated high school and it was time to move on to a larger university away from home, I chose Ohio Wesleyan University because it was one of only a few colleges with a genetics major. I loved being in the lab. I loved learning about cell reproduction, chemistry, and all that the major entails. But I loved psychology more. Psychology just clicked with me. I just intuitively knew it, and studying the names, years, and experiments was something that I loved. Keep reading to see how I'm using psychology to live healthier and how I reward myself with a cucumber green tea sugar scrub. One thing that I love about psychology is how you can change a person's behavior. Since it's not ethical to change someone else behavior as an undergrad, our class experiments were to change our own behavior. The professor asked us to identify one area in which we wanted to change. Some students choose cleaning the house more often. Some wanted to study more. I wanted to work out more. I was a broke college student, but I did pay for a yearly gym membership. The problem was that I never wanted to go. I needed a little boost to get me there because once I was there, I did great. Again, I was a broke college student. I didn't have money for extras like getting my nails done, although I really wanted them. I decided that my reward for going to the gym regularly was going to be getting my nails done. Since I was also going to have to pay to get them filled and airbrushed every two to three week, I'd have to change my behavior for longer than a few months. I wanted to go to the gym for a full month before I got my reward, so I divided the cost of my nails by 16 (four work outs a week for four weeks). When I went to the gym, I set the money aside for my nails. In four weeks, I was sporting beautiful airbrushed acrylics, which were all the rage in the late 90s. When people complimented me on my nails, I loved telling them how I earned them, and I felt great now that I was consistently working out four times a week. Operant conditioning is a way of learning through rewards and punishments. A positive reinforcement is adding something that makes it more likely to do a behavior. In my example, getting my nails done was added, and I was more likely to go to the gym, so it was using positive reinforcement. I still use rewards to keep myself motivated. Money is a great reward for my hard work, but I do still reward myself with little treats when I meet my goal. Balance Rewards for healthy choices™ works in a similar way. 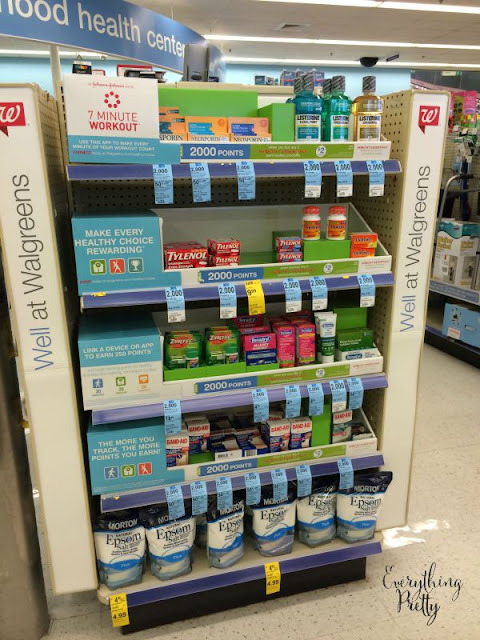 It's a program from Walgreens that rewards users for making healthy choices in the form of points. You get the points immediately, and then you can use them in the store towards your purchases. You earn points by exercising, logging your weight and blood pressure, and quitting smoking. Earning points is easy. For exercise, the app calculate how many steps I take using my iPhone. I don't always take my phone with me when I walk for exercise, so I can manually enter those. It also lets you log your weight and measurements every day for points. You can also sync the app with a wireless scale and other devices and apps to track your weight loss. Although I love the positive reinforcement and points, I really love how easy the app is to use. I used to keep logs in notebooks, but this is so much easier. I'm all for easy, especially since I'll be even busier this year homeschooling three kids and not just one child. Back to school time is when everything starts back up again, so it's easy to forget to take care of myself. But not this year! My favorite exercise lately is walking. I take a walk most evenings with the family. There is always something cool happening on a farm, and the scenery is amazing. The only drawback is that between the weed in the unmowed areas and the bugs, sometimes we come back a little itchy. It's nothing that a little Benadryl itch stopping gel can't help though. Sometimes the kids fall or get scrapped by a branch, so I picked up some Band-Aid bandages while I was at Walgreens. Since I bought two Johnson & Johnson Healthy Essential items, I earned 2,000 Balance Reward points too! This deal is valid from 7/26/15-8/29/15, so be sure to check it out. My Walgreens had an end cap display with eligible items, so they were easy to find. Now I'm the type of person who can wait for a bigger reward, but small, frequent rewards are always nice too. When I shower after exercising, I like using a yummy sugar scrub or handmade soap. Since my garden is doing so well this year, I decided to use some cucumbers to make an easy Cucumber Green Tea sugar scrub. 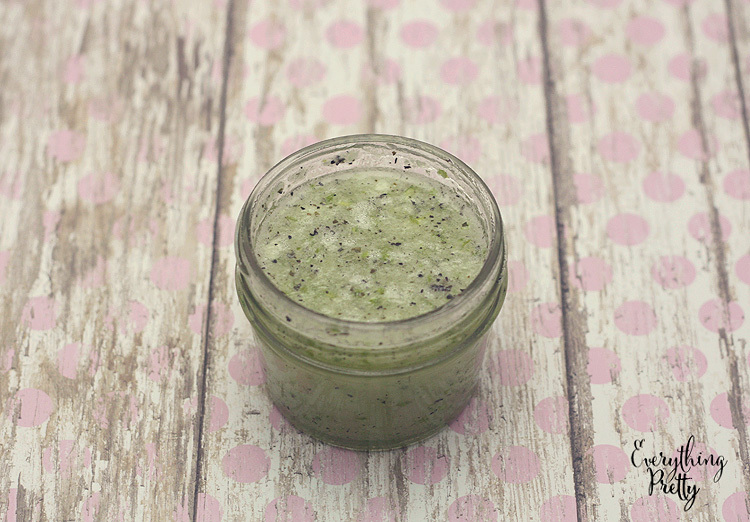 Chop the cucumber and puree in a blender until smooth. Set aside. Combine sugar and contents of the green tea bag in a bowl. Slowly add pureed cucumber and stir until you get the desired consistency. Since this recipe has a fresh cucumber, it has to be stored in the fridge. Yes, it's cold when you use it, but it feels great! Want to read about more ways to get healthy and active? Tell me in the comments how you reward yourself!